What you might not know is that cognitive biases – irrational tendencies built into the brain – can be hazardous to your wealth. One of the most dangerous of these is "confirmation bias." Oceans of investor wealth have been lost to confirmation bias over the course of history. And for investors today, it's just as dangerous as ever. That's the bad news. The good news is, you can beat confirmation bias – or at least safeguard against it – by always taking one simple step. What is confirmation bias? Roughly speaking, it's a habit of only seeking evidence that "confirms" a favored point of view. And the whole process works at the subconscious level. It is possible to be wholly in the grip of confirmation bias – even though it "feels" like you are being 100% rational. In fact, the smarter you are, the more vulnerable you are to confirmation bias as a rule... because smart people are better at rationalizing after-the-fact justifications for their beliefs. When it comes to investing, nobody is right all the time. A wise investor must sometimes say, "I was wrong." Confirmation bias can make it hard to sell your losing investments. It can also lead to missed opportunities... For example, an investor might miss a multiyear bull trend in an industry or sector because he refuses to change his initial bearish point of view. One of his most famous experiments not only underscores the presence of confirmation bias... It shows how you can beat it, or at least safeguard against it. They would offer guesses like "8-10-12" and "14-16-18". The experimenter would say "correct" multiple times. Then, the subjects would guess the rule with absolute confidence. But they were wrong. The actual rule was "three rising numbers in sequence." It could have been any three numbers... A guess of 3-47-104 would have worked just as well. But again, most people didn't do that. They got an early hunch, and it solidified – because they never attempted to disconfirm their original views. You could try the "rising by two" sequence 50 times or 500 times, and it wouldn't change your results. The experimenter would say "yes, that fits the rule" every time. And your final guess at the rule would still be wrong. Confirmation bias is wired into all human brains. The way to fight back against it is to do something counterintuitive: Make a regular habit of playing devil's advocate with yourself. Ask yourself: "What could make me wrong?" or "How can I see this differently?" It is not at all a normal habit to question one's own assumptions – to take the time and effort to challenge your own point of view. The brain is not built that way. When natural ways of thinking lead to irrational results, we can use higher order cognitive tools to adjust the image... and bring rationality back into the picture. In other words, you can develop a "counter habit" to the dangerous habit of confirmation bias. Practice asking yourself these questions to test your thesis... before you make an investment decision. I promise, it will be hugely valuable over time. Editor's note: If you'd like to take your investing game to the next level, we urge you to join Richard for the first-ever Bull vs. Bear Summit, TONIGHT at 8 p.m. Eastern time. You'll learn about the biggest forces at work in the markets today... Plus, Richard will share his unique method for determining the exact day to sell every stock in your portfolio. Register for tonight's FREE event right here. Recently, Richard shared another way to make smarter investments. It's an unusual way to use the power of hindsight to your advantage... Learn how it works right here: Boost Your Odds of Investment Success With This Simple Technique. "Are you bullish, bearish, or confused?" Ben Morris writes. As he explains, it's time to re-evaluate your stance on the markets... so you can make the right trading moves based on your outlook. Get the details right here. 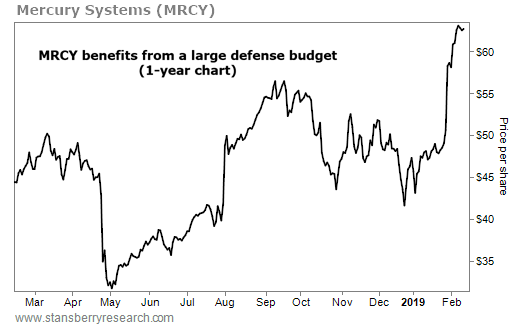 Mercury Systems (MRCY) is a $3 billion technology company. It makes high-speed computer systems for the military. The company has supplied its systems to more than 25 leading defense contractors. And when the top military suppliers use your processing systems, you’ll always be in high demand… In the most recent quarter, Mercury reported record sales of more than $159 million. That’s a 35% increase from the same period a year ago.